A small character area centred on the village of Pumsaint which is a linear settlement either side of the A482, at the confluence of the Afon Cothi with its tributary, the Afon Twrch. It once lay within Cwmwd Caeo of Cantref Mawr which remained an independent Welsh lordship until 1284, and largely retained native systems of tenure throughout the Medieval period. The A482 follows the line of the Roman road between the forts at Llandovery (Alabum) and Llanio (Bremia), past the Roman gold mines of Area 243 that were operational by the 1st century AD and necessitated the construction of a fort on the level ground beneath the present village. The fort site, Louentium, has been partially excavated (Jones and Little, 1974), and featured a detached bath-house building. Roman activity may have influenced subsequent settlement patterns. It has been claimed (Jones 1994, 88) that some gold exploitation persisted into the post-Roman period affecting the status of the surrounding area, which came to be regarded as important enough to be mentioned in the marginalia of the Book of St Chad (Jones 1994, 88), while a Medieval chapel, 'Llanpumsaint', erected within the fort ramparts probably has pre-Conquest origins (Sambrook and Page 1994, 4). It was a chapel-of-ease to Caeo parish mentioned in the will of Rhys Fychan in 1271 (ibid. ), and was marked on Saxton's map of Carmarthenshire of 1578. However, there is no evidence that it was accompanied by any nucleation. The development of the present village was probably encouraged by the Post-Medieval development of the Roman road into an important droving road and, from the late 18th-century, a mail road, and by the Post-Medieval Dolaucothi estate within which the village partly lay. The present pattern of large, regular fields also suggests estate remodelling of the landscape. By the later 19th century Pumsaint village contained a post office, public house, hall and stores. Dolaucothi House occupies the valley floor to the east of the village and was established by the Johnes family, a branch of the Jones family of Abermarlais, by 1679 when the house was already a building of some size, containing six hearths; in 1704 it was described as 'the capital messuage called 'Tyddyn Dole Cothi' (Jones 1987, 56). It was practically rebuilt in 1792-6 and by 1873 the estate comprised 3172 acres (ibid.). The house was requisitioned during the Second World War, the lead was stripped from the roofs and it was demolished in 1951 (Whittle 1999). The grounds were taken over by the National Trust in 1956. At the north end of the area is Brunant, a surviving gentry house with late 16th- or 17th-century origins (Jones 1987, 15). Base map reproduced from the OS map with the permission of Ordnance Survey on behalf of The Controller of Her Majesty's Stationery Office, © Crown Copyright 2001. This is a relatively small but complex character area. It lies across the valley floor and lower valley sides of the Afon Cothi upstream of Pumpsaint village at between 120 m and 200 m. In essence it is a late 18th- and 19th-century estate landscape which is superimposed over earlier landscape elements. 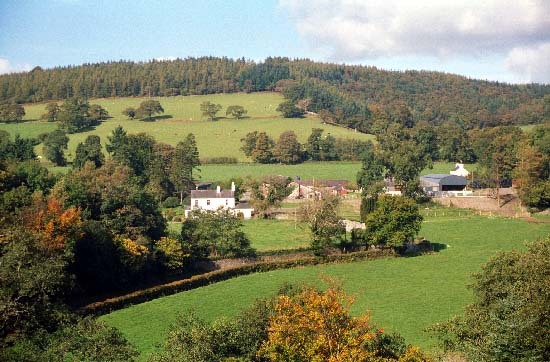 There are two focii: Dolaucothi House and Pumpsaint village. The late 18th- and early 19th-century house at Dolaucothi has been demolished, except for a northern wing which now serves as a farmhouse. A coach house also survives. Many elements of the park and gardens associated with the house also survive, including a walled garden, a ha-ha, drives and possible landscaping for walks along the river. The most distinctive element of the park, however, is the planting, with many fine specimen trees remaining. The whole of the floodplain of the Cothi retains a parkland appearance. At the northeastern end of the area the early 19th-century gentry house of Brunant and its setting continue the parkland aspect to the Cothi floodplain upstream of the former house of Dolaucothi. A Roman fort lies beneath Pumpsaint village, but little surface evidence for it survives. Houses and other buildings in the village date mainly to the mid 19th-century, and were constructed by the Dolaucothi estate with a distinctive signature - a 'pattern-book' style of coursed rubble walls, steeply pitched slate roofs, barge- and facia-boards (red painted) and casement windows with diamond panes. A chapel in the village dates to 1875, and close to it is a terrace of late 19th-century two-storey 'villa' houses not in the estate style. 20th century development is limited to a corrugated iron - tin - village hall and a few houses. Outside the village and parkland the area is divided into small irregular fields of improved pasture by earth banks topped by hedges. Hedges are not in good condition apart from those alongside roads and tracks. Many have long gaps and others are derelict. There are many distinctive hedgerow trees. Dispersed farms and other dwellings are generally in the Dolaucothi 1850s 'pattern book' style. Outbuildings to the farms are in the same style. Apart from the A482 road which runs through Pumpsaint village, transport links are local - minor roads, lanes and tracks. Recorded archaeology provides great time-depth, with nearly all periods being represented. It comprises a Neolithic findspot, a Bronze Age standing stone, the Roman road, fort, baths and coin hoard, the Medieval chapel site, an unknown cropmark, parkland features associated with the Dolaucothi estate, and buildings. There are many distinctive buildings, most of them constructed on behalf of the Dolaucothi estate. The house at Dolaucothi has gone but the site represents an early 19th-century parkland with remnants of possible lime avenue, two enclosed gardens extant c. 1770, totally remodelled c. 1790, and altered and improved in the early 19th-century. The walled garden is partially intact and the whole is entered as ref. number PGW (Dy) 1 (CAM) in the Cadw/ICOMOS Register of Parks and Gardens of Special Historic Interest in Wales (Whittle 1999). The stable block, carthouse, lodge and home farm are Grade II listed. Brunant, which contains 16th- or 17th-century elements, is also Grade II listed. There are 14 other Grade II listed buildings within the character area including Salem chapel from 1875, the public house, village hall, post office, stores, war memorial, forge and K6 telephone kiosk. 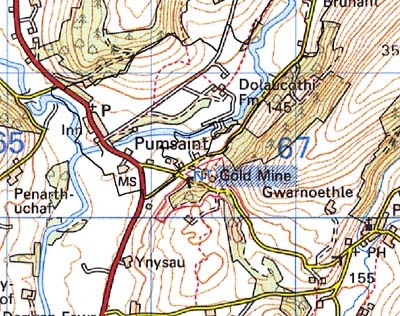 Although this area has very distinct historic components, its boundaries are not well defined; it merges with neighbouring areas to the northeast, east and southwest, but is better defined to the south against Dolaucothi Gold Mines.